The tulips at Mission Point Resort blossoming in the afternoon sunshine… Looks like spring may be here to stay. Another gorgeous spring afternoon on Mackinac Island… enjoying the view of the harbor from the fourth floor of Chippewa Hotel. We’re happy to see our tulips! We’re experiencing some random snow… At least the temperature is above freezing! Our tulips are making progress! So still in the Straits this morning. Annual painting of the Carriage Logo in the pool. Opening Day Fort Mackinac 2013 – Ducked low behind the carriage wheel as she fires the cannon. Spring on Mackinac. One of my favorite things…the daffodils at Mission Point Resort. 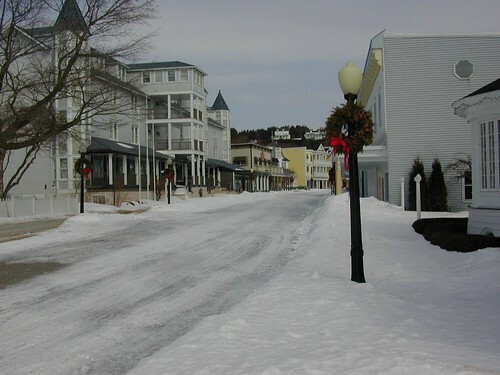 Mackinac Island .Net - Mackinac Island, Michigan - produced by North Guide Internet.